Our Broadcast SDI + HDMI Video Encoders Modulators are compatible with any SD HD 3G SDI Embedded and ANY HDMI Video Source, perfect for any DTV Broadcasting Application. 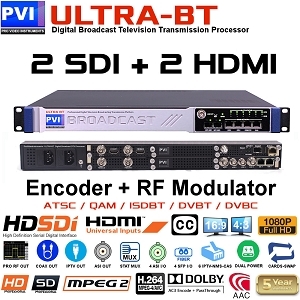 The ULTRA-BT-2SDI-2HDMI-ADVMUX is a Four channels HDTV Broadcast Digital Video Encoder with built-in Broadcast RF Transmission Modulator in a box, designed encode and live broadcast up to 4 independent channels of any SD/HD Video from 2x SDI and 2x HDMI video inputs, ideal solution for any Broadcasting, HDTV Headends, Professional digital television distribution systems. The SDI Video inputs are compatible to any SD/HD/3G SDI Video and embedded audio, up to 1080p, with the ability to select Audio Group & Pair for the stereo channel, or to pass-through any pre-encoded multi-channel dolby digital 5.1 / 7.1 or multi-language as well capture and pass any CC Closed Captioning TXT with the ability to select the used standard per each channel. The HDMI Video inputs are Fully HDMI Licensed and compatible with any HDMI Video source up to 1080p, with the ability to select Audio stereo or pass-through any pre-encoded multi-channel dolby digital 5.1 / 7.1 or multi-language as well capture and pass any CC Closed Captioning TXT fron the auxiliary BNC CC Video input port. Each Encoder channel has full and independent controls to customize output video and audio formats, MPEG2/H.264, HD/SD, Video Scaling if needed, Audio as Mpeg1L2/AAC/AC3 encoding or Bit-stream Pass-Through, Bitrate, StatMux, and as well all the Descriptors as Service Name, Service Provider, EIT 0/1/2, Time, Pids, VCT/LCN, and all the PSI/PSIP so every channel is ready for the transmission as wanted. The ULTRA-BT comes a multi-channel Stat-Mux Remultiplexer, so it is possible to create a different Mux of programs per each of the RF/IP/ASI outputs. The ULTRA-BT has also two IP inputs and four ASI input ports to receivea and remux-inject auxiliary transport stream data Feed such as Dynamic EPG, Additional Services, Etc. The EIT Event Information Table database can also be imported to the system to provide Events & Times to the receiving television ( Electronic Program Guide ), as well provides accurate Time by synchronizing with network time-zone servers via NMS port. The RF Modulator output is agile 30 - 950 Mhz @ 1Khz steps and can be level adjusted from -25 to +5dBm, ready to pilot directly any Power Transmitter, or any distribution Cable Network, with an excellent >47dB of MER quality and 55dB of shoulders, with Zero harmonics and spurious as the RF synthesizer is completely Digital based on OXCO precision oscillators for the maximum coverage and deliverability. The RF output can be switched at any time between ATSC 8VSB / QAM CABLE / ISDBT / DVBT / DVBC by loading the wanted software to the unit, also on site. The RF module can also turn on a total of 16 Carriers when used in Cable Headend mode, to route signals over RF as EDGE modulator. The ULTRA-BT also offers simultaneous IPTV Streaming Output as both RJ45 an Fiber SFP slots to feed any IP Network with SPTS ( single program transport streams - one per channel ) or MPTS ( multi program transport stream - mux of channels per each ip ), Ideal to feed any LAN VLAN SWITCH, VPN, STL Links, and for direct distribution to TVs and IP Boxes. One ASI Mux output port is available on the front panel, with its own remultiplexing control, to output the same or a different mux version respect the IP and the RF output. The other 4 ASI Ports on the rear panel ( where installed ) can be set to be additional ASI Inputs or ASI Mux outputs, each with its own ReMux control. The whole unit can save and restore setup presets for an easy ready-to-go installation or to clone multiple units where needed. Based on a Fully Modular design with dual redundant power supply, the ULTRA-BT offers unbeatable features and quality, with the ability to expand or service the unit on site thanks to the hot-swappable cards, for a true mission-critical non-stop operation capabilities. The ULTRA-BT is the ideal solution for any Broadcast or Professional Headend Distribution application where Hi-Density, Reliability, Quality, and Best Price are most wanted. The ULTRA-BT-2SDI-4HDMI-ADVMUX is a SIX channels HDTV Broadcast Digital Video Encoder with built-in Broadcast RF Transmission Modulator in a box, designed encode and live broadcast up to 6 independent channels of any SD/HD Video from 2x SDI and 4x HDMI video inputs, ideal solution for any Broadcasting, HDTV Headends, Professional digital television distribution systems. The SDI Video inputs are compatible to any SD/HD/3G SDI Video and embedded audio, up to 1080p, with the ability to select Audio Group & Pair for the stereo channel, or to pass-through any pre-encoded multi-channel dolby digital 5.1 / 7.1 or multi-language as well capture and pass any CC Closed Captioning TXT with the ability to select the used standard per each channel. The HDMI Video inputs are Fully HDMI Licensed and compatible with any HDMI Video source up to 1080p, with the ability to select Audio stereo or pass-through any pre-encoded multi-channel dolby digital 5.1 / 7.1 or multi-language as well capture and pass any CC Closed Captioning TXT fron the auxiliary BNC CC Video input port. Each Encoder channel has full and independent controls to customize output video and audio formats, MPEG2/H.264, HD/SD, Video Scaling if needed, Audio as Mpeg1L2/AAC/AC3 encoding or Bit-stream Pass-Through, Bitrate, StatMux, and as well all the Descriptors as Service Name, Service Provider, EIT 0/1/2, Time, Pids, VCT/LCN, and all the PSI/PSIP so every channel is ready for the transmission as wanted. The ULTRA-BT comes a multi-channel Stat-Mux Remultiplexer, so it is possible to create a different Mux of programs per each of the RF/IP/ASI outputs. The ULTRA-BT has also two IP inputs and four ASI input ports to receivea and remux-inject auxiliary transport stream data Feed such as Dynamic EPG, Additional Services, Etc. The EIT Event Information Table database can also be imported to the system to provide Events & Times to the receiving television ( Electronic Program Guide ), as well provides accurate Time by synchronizing with network time-zone servers via NMS port. The RF Modulator output is agile 30 - 950 Mhz @ 1Khz steps and can be level adjusted from -25 to +5dBm, ready to pilot directly any Power Transmitter, or any distribution Cable Network, with an excellent >47dB of MER quality and 55dB of shoulders, with Zero harmonics and spurious as the RF synthesizer is completely Digital based on OXCO precision oscillators for the maximum coverage and deliverability. The RF output can be switched at any time between ATSC 8VSB / QAM CABLE / ISDBT / DVBT / DVBC by loading the wanted software to the unit, also on site. The RF module can also turn on a total of 16 Carriers when used in Cable Headend mode, to route signals over RF as EDGE modulator. The ULTRA-BT also offers simultaneous IPTV Streaming Output as both RJ45 an Fiber SFP slots to feed any IP Network with SPTS ( single program transport streams - one per channel ) or MPTS ( multi program transport stream - mux of channels per each ip ), Ideal to feed any LAN VLAN SWITCH, VPN, STL Links, and for direct distribution to TVs and IP Boxes. One ASI Mux output port is available on the front panel, with its own remultiplexing control, to output the same or a different mux version respect the IP and the RF output. The other 4 ASI Ports on the rear panel ( where installed ) can be set to be additional ASI Inputs or ASI Mux outputs, each with its own ReMux control. The whole unit can save and restore setup presets for an easy ready-to-go installation or to clone multiple units where needed. Based on a Fully Modular design with dual redundant power supply, the ULTRA-BT offers unbeatable features and quality, with the ability to expand or service the unit on site thanks to the hot-swappable cards, for a true mission-critical non-stop operation capabilities. The ULTRA-BT is the ideal solution for any Broadcast or Professional Headend Distribution application where Hi-Density, Reliability, Quality, and Best Price are most wanted. The ULTRA-BT-2SDI-6HDMI-ADVMUX is a EIGHT channels HDTV Broadcast Digital Video Encoder with built-in Broadcast RF Transmission Modulator in a box, designed encode and live broadcast up to 6 independent channels of any SD/HD Video from 2x SDI and 6x HDMI video inputs, ideal solution for any Broadcasting, HDTV Headends, Professional digital television distribution systems. The SDI Video inputs are compatible to any SD/HD/3G SDI Video and embedded audio, up to 1080p, with the ability to select Audio Group & Pair for the stereo channel, or to pass-through any pre-encoded multi-channel dolby digital 5.1 / 7.1 or multi-language as well capture and pass any CC Closed Captioning TXT with the ability to select the used standard per each channel. The HDMI Video inputs are Fully HDMI Licensed and compatible with any HDMI Video source up to 1080p, with the ability to select Audio stereo or pass-through any pre-encoded multi-channel dolby digital 5.1 / 7.1 or multi-language as well capture and pass any CC Closed Captioning TXT fron the auxiliary BNC CC Video input port. Each Encoder channel has full and independent controls to customize output video and audio formats, MPEG2/H.264, HD/SD, Video Scaling if needed, Audio as Mpeg1L2/AAC/AC3 encoding or Bit-stream Pass-Through, Bitrate, StatMux, and as well all the Descriptors as Service Name, Service Provider, EIT 0/1/2, Time, Pids, VCT/LCN, and all the PSI/PSIP so every channel is ready for the transmission as wanted. The ULTRA-BT comes a multi-channel Stat-Mux Remultiplexer, so it is possible to create a different Mux of programs per each of the RF/IP/ASI outputs. The ULTRA-BT has also two IP inputs and four ASI input ports to receivea and remux-inject auxiliary transport stream data Feed such as Dynamic EPG, Additional Services, Etc. The EIT Event Information Table database can also be imported to the system to provide Events & Times to the receiving television ( Electronic Program Guide ), as well provides accurate Time by synchronizing with network time-zone servers via NMS port. The RF Modulator output is agile 30 - 950 Mhz @ 1Khz steps and can be level adjusted from -25 to +5dBm, ready to pilot directly any Power Transmitter, or any distribution Cable Network, with an excellent >47dB of MER quality and 55dB of shoulders, with Zero harmonics and spurious as the RF synthesizer is completely Digital based on OXCO precision oscillators for the maximum coverage and deliverability. The RF output can be switched at any time between ATSC 8VSB / QAM CABLE / ISDBT / DVBT / DVBC by loading the wanted software to the unit, also on site. The RF module can also turn on a total of 16 Carriers when used in Cable Headend mode, to route signals over RF as EDGE modulator. The ULTRA-BT also offers simultaneous IPTV Streaming Output as both RJ45 an Fiber SFP slots to feed any IP Network with SPTS ( single program transport streams - one per channel ) or MPTS ( multi program transport stream - mux of channels per each ip ), Ideal to feed any LAN VLAN SWITCH, VPN, STL Links, and for direct distribution to TVs and IP Boxes. One ASI Mux output port is available on the front panel, with its own remultiplexing control, to output the same or a different mux version respect the IP and the RF output. The other 4 ASI Ports on the rear panel ( where installed ) can be set to be additional ASI Inputs or ASI Mux outputs, each with its own ReMux control. The whole unit can save and restore setup presets for an easy ready-to-go installation or to clone multiple units where needed. Based on a Fully Modular design with dual redundant power supply, the ULTRA-BT offers unbeatable features and quality, with the ability to expand or service the unit on site thanks to the hot-swappable cards, for a true mission-critical non-stop operation capabilities. The ULTRA-BT is the ideal solution for any Broadcast or Professional Headend Distribution application where Hi-Density, Reliability, Quality, and Best Price are most wanted. The ULTRA-BT-4SDI-2HDMI-ADVMUX is a SIX channels HDTV Broadcast Digital Video Encoder with built-in Broadcast RF Transmission Modulator in a box, designed encode and live broadcast up to 6 independent channels of any SD/HD Video from 4x SDI and 2x HDMI video inputs, ideal solution for any Broadcasting, HDTV Headends, Professional digital television distribution systems. The SDI Video inputs are compatible to any SD/HD/3G SDI Video and embedded audio, up to 1080p, with the ability to select Audio Group & Pair for the stereo channel, or to pass-through any pre-encoded multi-channel dolby digital 5.1 / 7.1 or multi-language as well capture and pass any CC Closed Captioning TXT with the ability to select the used standard per each channel. The HDMI Video inputs are Fully HDMI Licensed and compatible with any HDMI Video source up to 1080p, with the ability to select Audio stereo or pass-through any pre-encoded multi-channel dolby digital 5.1 / 7.1 or multi-language as well capture and pass any CC Closed Captioning TXT fron the auxiliary BNC CC Video input port. Each Encoder channel has full and independent controls to customize output video and audio formats, MPEG2/H.264, HD/SD, Video Scaling if needed, Audio as Mpeg1L2/AAC/AC3 encoding or Bit-stream Pass-Through, Bitrate, StatMux, and as well all the Descriptors as Service Name, Service Provider, EIT 0/1/2, Time, Pids, VCT/LCN, and all the PSI/PSIP so every channel is ready for the transmission as wanted. The ULTRA-BT comes a multi-channel Stat-Mux Remultiplexer, so it is possible to create a different Mux of programs per each of the RF/IP/ASI outputs. The ULTRA-BT has also two IP inputs and four ASI input ports to receivea and remux-inject auxiliary transport stream data Feed such as Dynamic EPG, Additional Services, Etc. The EIT Event Information Table database can also be imported to the system to provide Events & Times to the receiving television ( Electronic Program Guide ), as well provides accurate Time by synchronizing with network time-zone servers via NMS port. The RF Modulator output is agile 30 - 950 Mhz @ 1Khz steps and can be level adjusted from -25 to +5dBm, ready to pilot directly any Power Transmitter, or any distribution Cable Network, with an excellent >47dB of MER quality and 55dB of shoulders, with Zero harmonics and spurious as the RF synthesizer is completely Digital based on OXCO precision oscillators for the maximum coverage and deliverability. The RF output can be switched at any time between ATSC 8VSB / QAM CABLE / ISDBT / DVBT / DVBC by loading the wanted software to the unit, also on site. The RF module can also turn on a total of 16 Carriers when used in Cable Headend mode, to route signals over RF as EDGE modulator. The ULTRA-BT also offers simultaneous IPTV Streaming Output as both RJ45 an Fiber SFP slots to feed any IP Network with SPTS ( single program transport streams - one per channel ) or MPTS ( multi program transport stream - mux of channels per each ip ), Ideal to feed any LAN VLAN SWITCH, VPN, STL Links, and for direct distribution to TVs and IP Boxes. One ASI Mux output port is available on the front panel, with its own remultiplexing control, to output the same or a different mux version respect the IP and the RF output. The other 4 ASI Ports on the rear panel ( where installed ) can be set to be additional ASI Inputs or ASI Mux outputs, each with its own ReMux control. The whole unit can save and restore setup presets for an easy ready-to-go installation or to clone multiple units where needed. Based on a Fully Modular design with dual redundant power supply, the ULTRA-BT offers unbeatable features and quality, with the ability to expand or service the unit on site thanks to the hot-swappable cards, for a true mission-critical non-stop operation capabilities. The ULTRA-BT is the ideal solution for any Broadcast or Professional Headend Distribution application where Hi-Density, Reliability, Quality, and Best Price are most wanted. The ULTRA-BT-4SDI-4HDMI-ADVMUX is a eight channels HDTV Broadcast Digital Video Encoder with built-in Broadcast RF Transmission Modulator in a box, designed encode and live broadcast up to 8 independent channels of any SD/HD Video from 4x SDI and 4x HDMI video inputs, ideal solution for any Broadcasting, HDTV Headends, Professional digital television distribution systems. The SDI Video inputs are compatible to any SD/HD/3G SDI Video and embedded audio, up to 1080p, with the ability to select Audio Group & Pair for the stereo channel, or to pass-through any pre-encoded multi-channel dolby digital 5.1 / 7.1 or multi-language as well capture and pass any CC Closed Captioning TXT with the ability to select the used standard per each channel. The HDMI Video inputs are Fully HDMI Licensed and compatible with any HDMI Video source up to 1080p, with the ability to select Audio stereo or pass-through any pre-encoded multi-channel dolby digital 5.1 / 7.1 or multi-language as well capture and pass any CC Closed Captioning TXT fron the auxiliary BNC CC Video input port. Each Encoder channel has full and independent controls to customize output video and audio formats, MPEG2/H.264, HD/SD, Video Scaling if needed, Audio as Mpeg1L2/AAC/AC3 encoding or Bit-stream Pass-Through, Bitrate, StatMux, and as well all the Descriptors as Service Name, Service Provider, EIT 0/1/2, Time, Pids, VCT/LCN, and all the PSI/PSIP so every channel is ready for the transmission as wanted. The ULTRA-BT comes a multi-channel Stat-Mux Remultiplexer, so it is possible to create a different Mux of programs per each of the RF/IP/ASI outputs. The ULTRA-BT has also two IP inputs and four ASI input ports to receivea and remux-inject auxiliary transport stream data Feed such as Dynamic EPG, Additional Services, Etc. The EIT Event Information Table database can also be imported to the system to provide Events & Times to the receiving television ( Electronic Program Guide ), as well provides accurate Time by synchronizing with network time-zone servers via NMS port. The RF Modulator output is agile 30 - 950 Mhz @ 1Khz steps and can be level adjusted from -25 to +5dBm, ready to pilot directly any Power Transmitter, or any distribution Cable Network, with an excellent >47dB of MER quality and 55dB of shoulders, with Zero harmonics and spurious as the RF synthesizer is completely Digital based on OXCO precision oscillators for the maximum coverage and deliverability. The RF output can be switched at any time between ATSC 8VSB / QAM CABLE / ISDBT / DVBT / DVBC by loading the wanted software to the unit, also on site. The RF module can also turn on a total of 16 Carriers when used in Cable Headend mode, to route signals over RF as EDGE modulator. The ULTRA-BT also offers simultaneous IPTV Streaming Output as both RJ45 an Fiber SFP slots to feed any IP Network with SPTS ( single program transport streams - one per channel ) or MPTS ( multi program transport stream - mux of channels per each ip ), Ideal to feed any LAN VLAN SWITCH, VPN, STL Links, and for direct distribution to TVs and IP Boxes. One ASI Mux output port is available on the front panel, with its own remultiplexing control, to output the same or a different mux version respect the IP and the RF output. The other 4 ASI Ports on the rear panel ( where installed ) can be set to be additional ASI Inputs or ASI Mux outputs, each with its own ReMux control. The whole unit can save and restore setup presets for an easy ready-to-go installation or to clone multiple units where needed. Based on a Fully Modular design with dual redundant power supply, the ULTRA-BT offers unbeatable features and quality, with the ability to expand or service the unit on site thanks to the hot-swappable cards, for a true mission-critical non-stop operation capabilities. The ULTRA-BT is the ideal solution for any Broadcast or Professional Headend Distribution application where Hi-Density, Reliability, Quality, and Best Price are most wanted. The ULTRA-BT-6SDI-2HDMI-ADVMUX is a EIGHT channels HDTV Broadcast Digital Video Encoder with built-in Broadcast RF Transmission Modulator in a box, designed encode and live broadcast up to 6 independent channels of any SD/HD Video from 6x SDI and 2x HDMI video inputs, ideal solution for any Broadcasting, HDTV Headends, Professional digital television distribution systems. The SDI Video inputs are compatible to any SD/HD/3G SDI Video and embedded audio, up to 1080p, with the ability to select Audio Group & Pair for the stereo channel, or to pass-through any pre-encoded multi-channel dolby digital 5.1 / 7.1 or multi-language as well capture and pass any CC Closed Captioning TXT with the ability to select the used standard per each channel. The HDMI Video inputs are Fully HDMI Licensed and compatible with any HDMI Video source up to 1080p, with the ability to select Audio stereo or pass-through any pre-encoded multi-channel dolby digital 5.1 / 7.1 or multi-language as well capture and pass any CC Closed Captioning TXT fron the auxiliary BNC CC Video input port. Each Encoder channel has full and independent controls to customize output video and audio formats, MPEG2/H.264, HD/SD, Video Scaling if needed, Audio as Mpeg1L2/AAC/AC3 encoding or Bit-stream Pass-Through, Bitrate, StatMux, and as well all the Descriptors as Service Name, Service Provider, EIT 0/1/2, Time, Pids, VCT/LCN, and all the PSI/PSIP so every channel is ready for the transmission as wanted. The ULTRA-BT comes a multi-channel Stat-Mux Remultiplexer, so it is possible to create a different Mux of programs per each of the RF/IP/ASI outputs. The ULTRA-BT has also two IP inputs and four ASI input ports to receivea and remux-inject auxiliary transport stream data Feed such as Dynamic EPG, Additional Services, Etc. The EIT Event Information Table database can also be imported to the system to provide Events & Times to the receiving television ( Electronic Program Guide ), as well provides accurate Time by synchronizing with network time-zone servers via NMS port. The RF Modulator output is agile 30 - 950 Mhz @ 1Khz steps and can be level adjusted from -25 to +5dBm, ready to pilot directly any Power Transmitter, or any distribution Cable Network, with an excellent >47dB of MER quality and 55dB of shoulders, with Zero harmonics and spurious as the RF synthesizer is completely Digital based on OXCO precision oscillators for the maximum coverage and deliverability. The RF output can be switched at any time between ATSC 8VSB / QAM CABLE / ISDBT / DVBT / DVBC by loading the wanted software to the unit, also on site. The RF module can also turn on a total of 16 Carriers when used in Cable Headend mode, to route signals over RF as EDGE modulator. The ULTRA-BT also offers simultaneous IPTV Streaming Output as both RJ45 an Fiber SFP slots to feed any IP Network with SPTS ( single program transport streams - one per channel ) or MPTS ( multi program transport stream - mux of channels per each ip ), Ideal to feed any LAN VLAN SWITCH, VPN, STL Links, and for direct distribution to TVs and IP Boxes. One ASI Mux output port is available on the front panel, with its own remultiplexing control, to output the same or a different mux version respect the IP and the RF output. The other 4 ASI Ports on the rear panel ( where installed ) can be set to be additional ASI Inputs or ASI Mux outputs, each with its own ReMux control. The whole unit can save and restore setup presets for an easy ready-to-go installation or to clone multiple units where needed. Based on a Fully Modular design with dual redundant power supply, the ULTRA-BT offers unbeatable features and quality, with the ability to expand or service the unit on site thanks to the hot-swappable cards, for a true mission-critical non-stop operation capabilities. The ULTRA-BT is the ideal solution for any Broadcast or Professional Headend Distribution application where Hi-Density, Reliability, Quality, and Best Price are most wanted.